Long before Americans had the option of buying organic and local produce at a local grocery store, farmers markets of all sizes and shapes were providing healthy locally grown food that are good not only for the consumer but for the farmer, as well. Missouri is home to more than 135 farmers markets, all of which provide a rich variety of homegrown fruits and vegetables as well as locally produced goods such as dairy, eggs, meat, fish, mushrooms, baked goods, jams and jellies, honey, cut flowers, bedding plants and much more! 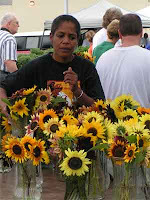 The farmers’ market experience is unusual as it allows the shopper to meet the people who produce the goods they're buying, which lets the consumer get the facts about how the food is produced. Not only is putting a face on the origins of our food important it is beneficial to local growers who get to cut the middleman and sell directly to the consumer. Consumers are likely to find everything from locally produced dog treats to homemade candles also at many of our Missouri markets. Whether you're seeking healthful, high-quality foods and products, looking to add a variety in your cooking or just wanting to have a fun shopping experience, Missouri farmers markets will have something for you this season. Get out and support your local farmers and buy local this season. Find a market in your area through the Missouri Farmers’ Market Directory.